I went to the new South Hadley Public Library, 2 Canal Street, in the South Hadley Lower Falls area. Fabulous new building with fantastic views of the Falls, but I digress. I went to the new library to peruse the garden books. Most were the usual ‘planning a better garden’ variety, and we have all seen and read most of those (I think we all could write this type of book). THE NONSTOP GARDEN…..oh wait, take a look at that one. 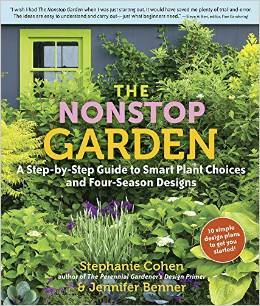 THE NONSTOP GARDEN A Step-by-Step Guide to Smart Plant Choices and Four-Season Designs by Stephanie Cohen and Jennifer Benner and published by Timber Press in 2010. Yes, this is another how-to-plan-your-garden book, but from a slightly different view point. This book is encouraging more diversity of plantings to fill in those seasonal gaps. You know, having 25 different varieties of day lilies is great, but what about the rest of the summer? Or after the snap peas have finished in the patio pot, now what do I do? The definition of the nonstop garden is an integrated garden (trees, shrubs, perennials, bulbs, annuals, tropicals, edibles, vines) for year-round interest. Part One is The Nuts and Bolts. Benefits of the nonstop garden and design strategies is not only to provide continual interest and beauty, but more creativity and diversity of plantings. The greater the mix of seasonal plants, the more enjoyable the garden throughout the entire year. More diversity also brings in more nature. More diversity, the happier and healthier your garden will be. The authors’ emphasis is on choosing native plantings whenever possible. Natives are better suited to our hardiness zones and soil conditions, but also minimize the encouragement of new species of insects and diseases to our area. The authors encourage us to research origins of any species not native to determine suitability (hardiness and diseases) for your garden, and invasive potential. Part Two is called the Main Attractions with discussions, descriptions, and photos of Trees, Shrubs, and Perennials. And encouragement to add trees and shrubs to our perennial borders, or perennials around our trees and shrubs. Part Three is the Supporting Cast including Bulbs, Annuals and Tropicals, Edibles, and Vines descriptions, recommendations, and photos. Part Four covers the Finishing Touches of Ornamentation, Containers, Structures, and Seasonal Beauty and Interest again with great descriptions and photos of paths, arbors, and the personal ornaments we all love to place in our gardens. There are also 10 Garden Design Plans included, starting with a Winter Wonderland to the Scented Garden, to what the authors call the ‘Inferno Strip’, you know, the strip of land between the side walk and the street where nothing beautiful grows. This plan consists of 10 tough, drought-tolerant low growing plants for these hot, sunny locations, and includes a few stepping stones for passage through the garden where necessary. Included is a chart called Peak Performance at a Glance with the key plants listed with their hardiness zone, bloom time, any notable fruit to seedheads, long-lasting foliage, and fall foliage or winter interest noted. There are two pages dedicated to a list of invasive plants and included are the links to local state agencies for further information. And a conversion table for those of us who can’t remember how to convert temperature from Fahrenheit to Celsius, and inches to centimeters, feet to meters. About the authors: Stephanie Cohen may be familiar to you as she writes a column for Fine Gardening. Jennifer Benner is an associate editor, also at Fine Gardening magazine.